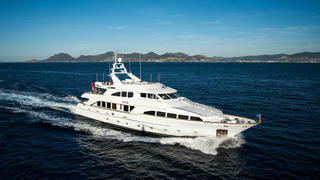 The 35 metre motor yacht DXB, listed for sale by Blackorange Yachts and Burgess, has had a €1,000,000 price reduction. Built in GRP by Italian yard Benetti to a design by Stefano Righini, she was delivered in 2003 and most recently refitted in 2015. An interior designed by Francois Zuretti features cherry wood panelling throughout accommodating 10 guests in five cabins consisting of a full-beam master suite, two VIP suites and two twins, all with entertainment centres, television screens and en-suite bathroom facilities. In addition, there are quarters for seven crew in four cabins. The saloon of this yacht for sale is open plan, with the lounge area situated aft and formal dining forward. A full wet bar, also forward of the lounge area, comes complete with fitted bar stools. The saloon leads out onto a shaded aft deck, complete with al fresco dining options and seating, perfect for entertaining throughout the day and long into those warm Mediterranean evenings. Upstairs, a welcoming sky lounge has a full bar, comfortable sofas, a games table and a retractable plasma screen television. The panoramic sundeck features comfortable seating beneath a sunshade, a barbecue, bar, fridge, Jacuzzi, a shower and sun loungers. Twin 1,400hp Caterpillar diesel engines give her a range of 1,300 nautical miles and she is fitted with Naiad zero speed stabilisers. Available to view in the South of France, DXB is now asking €4.9 million.